But I didn't. And I'm thankful. I had parked my car at Preston Center, the side with Montlake Cut and the DSW shoe store. I was heading to The GEM to pick up green juice for one of our semi-weekly taste tests. I crossed the street, looking both ways beforehand—as a responsible pedestrian should. I even did a slight jog-hop while approaching the curb, as not to hold up traffic. Good job, me. As I passed Flying Fish, eyeing the dining room to see who was in there (nobody I knew), I heard a car noise. This is the only way I know how to describe this sound, because what occurred next happened so abruptly that I don’t fully remember it. I slowed my pace and the next thing I knew, a blueish-greenish Toyota sedan came plowing over the curb and onto the sidewalk. It struck the wall of Tuesday Morning so hard that it split the bricks and separated them from the wall. It caused a shelving unit inside the window to wobble. I saw something fall. Maybe a vase. Again, it happened so suddenly that I don’t know for sure. I stood there frozen. Profanities, strung together in a not-so-coherent sentence, spewed from my lips. I took several steps back as people came running over to the car. They opened the door and assisted an elderly woman with puffy grey hair and oval glasses. She appeared to be physically fine, but stunned. I walked around the car, hopped back on the sidewalk, with my hands shaking and head pounding, and continued onward. A lady dressed in black approached me and asked if I was okay. She told me she saw me jump back. I don’t know if I did or not. I don’t remember. “Yeah, I’m fine,” I told her. I took a few more steps toward my destination and was approached by a fit woman in a tank top. “Are you okay?” she asked. “Yeah,” I said. “Are you sure?” she persisted. This time the question struck me in a weird way. She had a genuinely concerned expression on her face. Oh my gosh? Did I almost just die? I could feel tears starting to gather in whichever the part of the eye they do this sort of thing. No, no, no. You will not cry in a public place in front of a woman you’ve known for 10 seconds. “You really should sit down,” she said. I nodded in agreement. She led me into Preston Gym and handed me a bottle of water. I sat on a piece of equipment and stared at my phone. My hands were still shaking. I’m not sure how close I was to actually getting hit. What I do know, however, is that if I had been a few paces further on my trek, that I would have ended up completely smooshed. Pinned, by an elderly woman in a sedan, to the wall of a Tuesday Morning, on a Wednesday afternoon. What an utterly stupid way to die. I finished my water, thanked the gym lady, and exited. The fire department was on the scene. 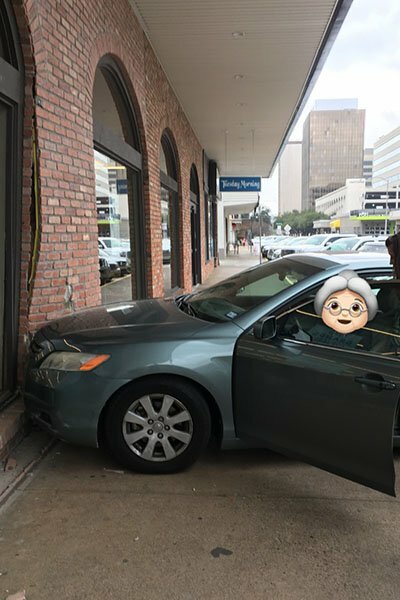 The elderly woman was standing outside of her vehicle. I’m glad she’s okay. When I made it to The GEM, the girl at the cash register asked how my day was. “Well, I almost just got hit by a car,” I responded without hesitation. “Oh my! What will you do with the rest of your day, friend?” she asked. “Oh, I don’t know. Go back to work. Maybe eat some noodles later,” I said. I did go back to work. But I didn’t eat noodles. Matt Goodman convinced me to join him for happy hour at The Grapevine Bar. It was excellent. Anytime somebody asked how my day was, I responded, earnestly, with “well, I almost died.” I drank for free all night. It was like a birthday, except better. It was an I’m-still-alive day. We should all feel so lucky to be having one of those days today.